The National Vetting Bureau (Children and Vulnerable Persons) National Vetting Bureau (Children and Vulnerable Persons) Acts 2012 to 2016 provide a statutory basis for the vetting of persons carrying out relevant work with children or vulnerable adults. The Act, commenced on 29th April 2016, also introduced electronic vetting (eVetting). 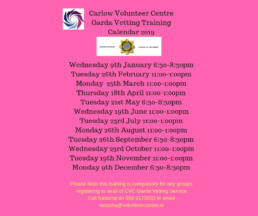 Carlow Volunteer Centre, as part of our commitment to supporting and promoting volunteering have introduced a Garda Vetting service for voluntary and community groups. All Volunteer Centres now act as an Authorised Signatory for Garda Vetting purposes for voluntary and community organisations that do not otherwise have access to an authorised signatory. Volunteer Centre Ireland and member Volunteer Centres have developed a number of documents to ensure best practice in and assist organisations with Garda Vetting and an agreement on the service with the Garda Vetting Unit and Data Protection. To carry out a risk assessment of all the roles in your organisation to help you assess whether the person being vetted can build up a relationship or trust with a child or vulnerable adult. The Act requires you to carry out a vet before you engage an employee or volunteer. (However you can engage them in non-relevant work). Vetting subjects need to be vetted for each individual role that they take up with an organisation, where vetting is required. Vetting disclosures must be made available to vetting subjects; therefore you must retain a copy of the disclosure for the length of time that the volunteer or employee is with you. You must check, verify and keep proof of the vetting subjects’ identity on file. As set out in the Act – all youth leaders, coaches, trainers, religious leaders who work with groups of children, whether alone or accompanied by another adult, must be vetted. For the purposes of the Act, a child is someone under the age of 18. What is relevant work or activities? Any work or activities, which is carried out by a person, a necessary and regular part of which consists mainly of the person having access to, or contact with children or vulnerable persons. A full list of relevant work or activities can be obtained in Part 1 and 2 of Schedule 1 in the Act. What is a vulnerable adult? d) has a physical disability. ii. That results in the person requiring assistance with the activities of daily living including dressing, eating, walking, washing and bathing. Any person who is carrying out work or activity, a necessary and regular part of which consists mainly of the person having access to, or contact with, children (under 18’s) or vulnerable adults. A relevant organisation shall not permit any person to undertake relevant work or activities on behalf of the organisation unless the organisation receives a vetting disclosure from the National Vetting Bureau in respect of that person. A person who contravenes this section shall be guilty of an offence. Who are the registered and relevant bodies? If you would like to find out more or ask about signing up for our service please email vetting@volunteersouthdublin.ie or phone 01 . 462 8558 You will need to register with the Centre, attend a training session and sign a Service Level Agreement before we can vet for you.During your training you will receive all the necessary information and forms to guide you through the process. The administrative fee is €5-€7,50 per form, depending on the type of organisation. Since the introduction of electronic vetting (eVetting) it takes approximately one to two weeks for the forms to be processed by the National Vetting Bureau.